Dinner: Tuesday - Sunday: 5:00pm - 2:00am. Weekend Brunch: Saturday - Sunday: 12:00pm - 3:30pm. 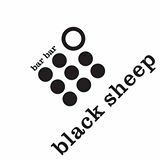 Classic drinks, a stay-and-relax atmosphere and good food is what Bar Bar Black Sheep, a dining bar, is all about. Dine, drink and talk comfortably while you enjoy the view of canvases by local artists and the sounds of area musicians. We have created a simple, honest, down-to-earth environment without pretense while supporting local growers, talent and patrons.